I can’t find this one in any listings, and it’s not open. It’s back off the road, no parking lot, big piles of dirt up front. It’s on the Westbound side of the Emerald Coast parkway, rt. 98 / rt.30, next door to dankel plaza. 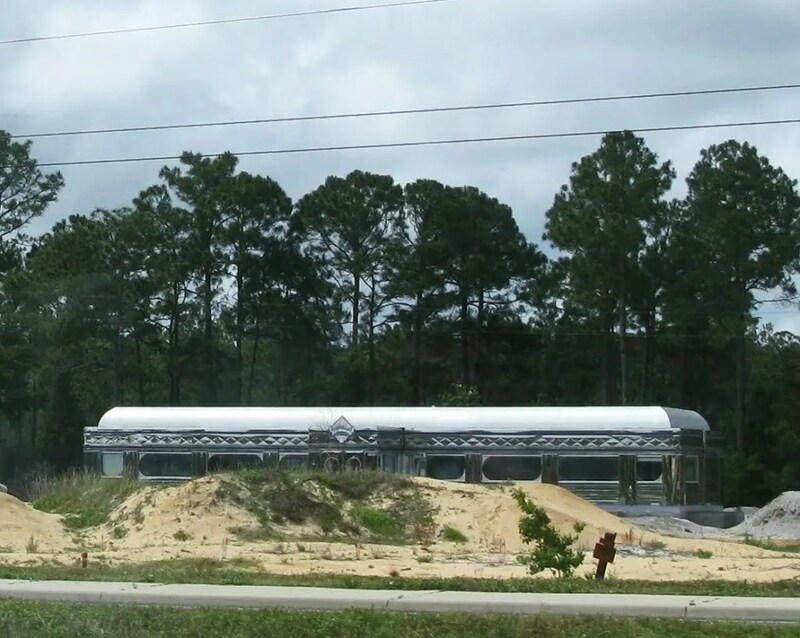 This entry was posted in Diners / roadside related, Diners/ restaurants and tagged Dankel Plaza, diner, Florida, new diner, roadside, Santa Rosa Beach, starlite diner, unknown by Spencer Stewart. Bookmark the permalink. is school done for the year for you?? When did you catch Diner Fever? I have NO listings for Santa Rosa Beach, FL. Mike- yeah, school year’s done. It’s summer for me. Time for a little fun. Mario- I’ve been doing the diner thing now for six years or so. The diner’s new, and I’m assuming it’s new to the location and hasn’t been fully set up yet. I noticed that diner several weeks ago as I was cruising down 98. I worked as an ad rep for The Destin Log newspaper in the ’90s, and that was one of my accounts. I believe it opened in 1997 and was brand-new then. It was located a bit west of Silver Sands Outlet Stores and may be on its original lot but just pushed back from the road more. I need to look at it again to be sure. The owner was a young guy who had several investors, and he always seemed to be in a state of panic. 🙂 I’m not sure when it closed, and I can’t remember its name (“Silver” Something?). I’ll check in here again if I think of anything else or can find some old ads for it. Yes. The Santa Rosa Beach diner is from Destin. I had it confirmed by a reputable diner manufacturer. I also got news about a Margate, Florida diner called the New Main Street Diner.